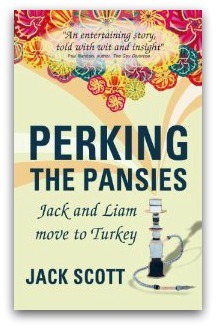 For some months, I’ve been a big fan of Jack Scott and his blog, Perking the Pansies. Judging by the readership numbers, I’m not the only one, but that’s unsurprising. Apart from the fact that Jack is one of the nicest bloggers on the block, how could anyone not be enticed by his introduction? Thankfully, the imminent publication of Jack Scott’s memoir, Perking the Pansies — The Book, means that readers will no longer have to scroll through months of blog posts for the answer to that question. While the blog’s first post gives a brief account of how Jack and his husband Liam left London for Turkey, the book fleshes out the logistics in a far more satisfactory manner. Most people “of a certain age” will identify with the events leading up to this dramatic change in lifestyle. A midlife crisis, a middle-aged realization that personal happiness and mental health are worth infinitely more than a big number in the bank account, plus a couple of pieces of golden luck to make it all happen – how many of us have dreamed of just this, to leave the rat race behind and live in our own little Paradise? Naturally, it’s not as simple as that. In leaving the corporate rat race behind, Jack and Liam encountered a new one – the expat rat race. It doesn’t matter where you are an expat – if you’ve ever lived abroad among fellow countrymen with whom you have nothing in common except nationality, you will recognize the competitors in this race. Jack describes them in detail enough to make the reader wince in sympathy. While I could continue to reminisce about other people I met between the pages of PTP, I won’t. Suffice it to say that Perking The Pansies is not so much about Jack’s Adventures Through The Looking Glass, but more about Who He Found There – a refreshing change from the many memoirs whose authors are constantly center-stage. Oh Jack — if only all your expat acquaintances could say the same thing. I’m looking forward to your next book already. I’m sure Jack can give us some more details! As the publishing process rolls out, the book is becoming available at various outlets through the main book distributors, including WH Smith and Waterstones in the UK and the equivalent in the USA. All major bookstores will be able to stock it or order it for you. I really hope you like it. Well I’m staggered. A stunning review. Much more than I could have hoped for. I love the fact you picked up the British cultural references. I’ll be posting it everywhere, sticking it on random trees along the road, handing it out on buses and stalking people outside supermarkets. Thank you. I really appreciate it. I haven’t read the book yet, but I gather from Kate’s review that you’ve captured that special time when the expat life is still a novelty; when you, as a new arrival, are more of an observer than a full-fledged participant; and when a lot of what you see quite frankly horrifies you. That particular constellation of emotions brings back memories for me of when I first went to Tokyo. I remember thinking how much I cherished my outsider status — I never wanted to become “one of them.” But then, somewhere along the line, I became yet another example of an eccentric gaijin who’d been in Japan too long. I assume you and Liam have an exit strategy in mind for when that happens, as it almost inevitably will? Or maybe that’s the next book? !